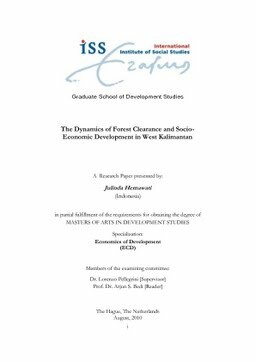 This study tries to examine the relationship between income of local household and deforestation in forest area in West Kalimantan, Indonesia. This study conducted is based on village level data. There are two types of data used in this study: spatial data and village level data and household survey in-formation. Spatial data is used to find the changes of forest cover in Province West Kalimantan from period1998 – 2004. Forest cover and forest cover change data are derived from Interpretation of Satellite Image Landsat 7 ETM+ 2002/2003 for forest cover in 2002 and 2003 which has been overlaid with Administrative Map by using ArcView, software of GIS. Data for income per capita and household characteristics are obtained from Susenas (National Socio-Economic Survey) in 2004. Village infrastructure condition is obtained from Village Potential Survey (Podes) in 2003. Using those combinations of data, allow this study to implement spatial econ-ometric approach to examine the impact of forest clearance on the household income. The result shows that between period 1998 and 2004, forest clearance has non linear U-shaped relationship with income per capita of household. This result suggests that when deforestation starts to increase, income will be decreasing, but when deforestation rate reaches the minimum point, income will start to increase as the deforestation increase. It also indicates that people in our ob-servation still dependent on forest activities. Furthermore, we also investigate the relationship between income per capita, deforestation, and forest cover. We use threshold of 1% deforestation rate and 1% level of forest cover. The findings show that the there is a positively weak relationship between deforestation (forest clearance) and income.